The Indus River Delta forms where the Indus River flows into the Arabian Sea, creating a complex system of swamps, streams and mangrove forests. Reduced river flows are threatening the survival of many species found here, including one of the world's rarest dolphins. Originating high on the Tibetan Plateau, the Indus River flows more than 3,000km before emptying into the Arabian Sea. It is here where the fan-shaped delta forms an extensive system of swamps, mudflats, creeks, estuaries, marshes and mangroves forests. The Indus River Delta is an important region for migrating water birds, and is an area rich in fish, including giant snakehead (Channa marulius), Indus baril (Barilius modestus), Indus garua (Clupisoma naziri) and Rita catfish (Rita rita). It is also home to one of the few species of freshwater dolphin, the Indus river dolphin (Platanista minor). Dams along the river reduce flows, particularly in lower parts of the Indus River, limiting the transport of much-needed fertile sediments downstream into the delta. They also fragment freshwater habitat, posing a serious threat to the survival of the river dolphin and other species. Water extraction for irrigation, runoff of chemicals into the river and introduced species also threaten the delta's freshwater species. WWF works in Pakistan to conserve Indus river dolphin habitat and reduce water pollution. The international environmental organization also focuses on freshwater scarcity in the coastal areas of the Indus Delta. 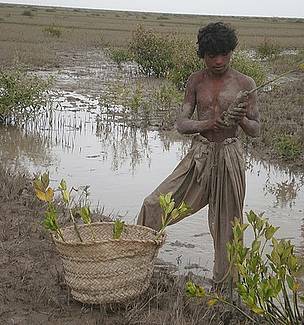 Planting mangroves to restore degraded lands in the Indus Delta. The Indus river dolphin (Platanista minor) is one of the world's rarest mammal and most endangered cetaceans. Only about 1,000 of this unique species exist today in the lower reaches of the Indus River in Pakistan. Water pollution, poaching and habitat fragmentation due to dams and irrigation systems are all threatening the dolphin's survival. WWF works to conserve their habitat and has been involved in a number of rescue missions where individual dolphins find themselves trapped in canals. Other threatened river dolphins include the Ganges river dolphin (Platanista gangetica), Yangtze river dolphin (Lipotes vexillifer) and Amazon river dolphin (Inia geoffrensis). Where is the Indus Delta? The Indus is the 5th largest delta system in the world and has the 7th largest mangrove forest system. The Indus River flows 3,000km before emptying into the Indus Delta. The delta covers an area of about 41,440km2, and is approximately 210 kilometres across where it meets the sea. It receives between 25-50cm of rain in a normal year. Pakistan's 5th largest city, Hyderabad, lies about 210 kilometres to the north of the mouths of the Indus. The Indus Delta was designated a Ramsar Wetland of International Importance on 5 November 2002.